At Hillenberg, every single detail – from the well-executed acoustics and comfortable seating, right down to the design of the butter knives – has been thought of and hand-selected to create a dining experience that is personal, commodious and timeless. Owned by hospitality group Stureplansgruppen, the restaurant is, explains restaurateur and chef Karl Ljung, ‘a place for grown-ups’. Following Ljung’s cue, Gothenburg-based architectural firm Okidoki has come up with an honest and functional design scheme with a long-term perspective. 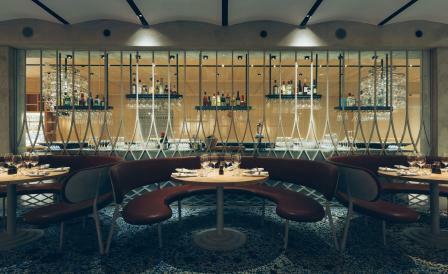 The undulating pattern that features alongside classic, durable materials such as marble and leather is repeated in different formations throughout the dining room, bar and cocktail bar, creating a setting that will look as good in 50 years as it does today. The menu, which comprises of European classics with a Scandinavian touch, offers a grand finale in the form of talented pastry chef Sara Hultberg’s irresistible treats.